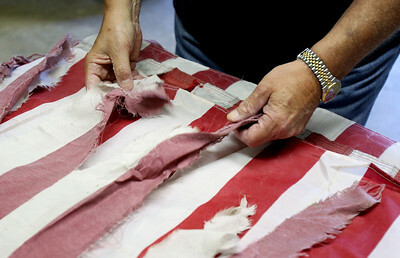 Sarah Nader - snader@shawmedia.com Senior Vice Commander of VFW Post 4600 Thomas McCormack of McHenry unfolds hundreds of old and damaged American flags on Tuesday, June 12, 2012 in preparation for the VFW Post 4600 annual flag burning ceremony this Thursday. Last year the VFW properly disposed of over 400 flags. Sarah Nader - snader@shawmedia.com Senior Vice Commander of VFW Post 4600 Thomas McCormack of McHenry untangled a damaged American flags on while preparing for the VFW Post 4600 annual flag burning ceremony this Thursday. Last year the VFW properly disposed of over 400 flags. 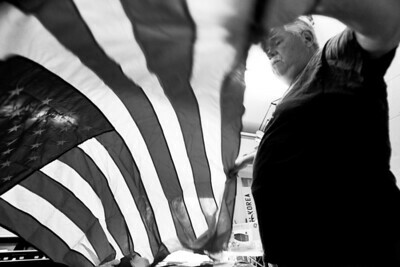 Senior Vice Commander of VFW Post 4600 Thomas McCormack of McHenry untangled a damaged American flags on while preparing for the VFW Post 4600 annual flag burning ceremony this Thursday. Last year the VFW properly disposed of over 400 flags.